Each photo we make tells a story, and for many of us, we aim to bring toys to life through our images. Generally, this is done in one of two ways – showing the life of a toy, or showing life through a toy. The latter aims to blur the line between fantasy and reality and thus cause the viewer to think twice about the size of the objects within the photo. While I’ve discussed the history of toy photography here before, I’d like to now focus on the genre that sometimes overlaps with toy photography – photo fakery. Photo fakery, at its core is probably something you’re very familiar with. Think magazine covers with heavily photoshopped models, or more closely related to this blog, cinematic film sets made entirely of intricate miniature models (see ‘further reading’ below). But for 100 years, if not more, people have been using small objects within photographs for large-scale results. And no matter the desired goal, this has been done in part to trick the viewer into believing the photo before them is of the full scale, real world. Photography’s roots lie in truth. While in modern times we recognize photos are easily, and quite often, manipulated, photos still tend to be considered representative of what was in front of the camera lens, and therefore, a more believable medium than say painting. While photo fakery ranges from merging photos, deleting and adding details through dark room or digital techniques, and using photos in unintended ways – such as with misleading news-like captions, for the purposes of this post, I’m only going to discuss those which involve toys or similar small-scale objects. Elsie Wright and Francis Griffiths began to create the images, later referred to as the Cottingley Fairies in 1917. These photos of cardboard fairies captured the public’s attention as proof of the existence of fairy creatures when Sir Arthur Conan Doyle used them to illustrate a story in 1920. The truth behind the photos, while it had been questioned, was not revealed until the early 1980s. 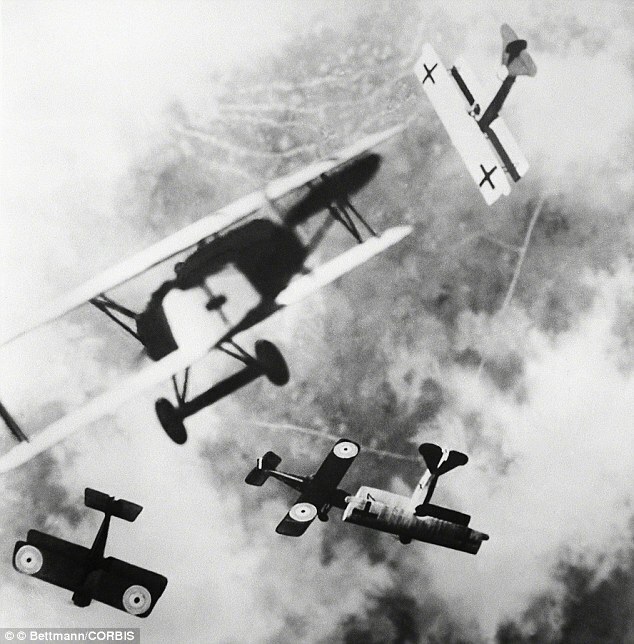 “The most extraordinary photographs ever taken of air flights in war.” (The Illustrated London News) were some 50 images compiled in the book ‘Death in the Air: The War Diary and Photographs of a Flying Corps Pilot‘ (a book still available for purchase today) published in 1933. 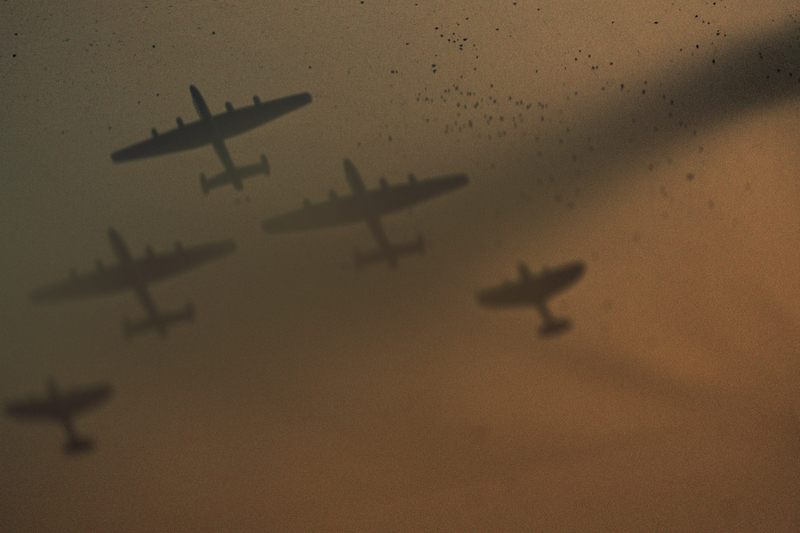 These images however were of model planes and created by model maker Wesley David Archer. Examined and believed to be of models, by a CIA photo expert in the early 1950s, deemed as fake by Time-Life Laboratory in 1979, these photos were not officially proven false until after Archer’s death, when some of his belongings were given to the Smithsonian Air and Space Museum in 1984, over 50 years after their publication. The most famous photo of the Loch Ness Monster was captured in 1934 by Lieutenant Colonel Robert Kenneth Wilson. This photo however was actually of a 14 inch toy submarine with an attached serpent head. This was not revealed however for another 60 years, when one of the men involved confessed on his deathbed. Photographs involving realistic depictions of toys haven’t always been so manipulative however. David Levinthal who began photographing toys in 1972, has always been upfront about his subject matter. 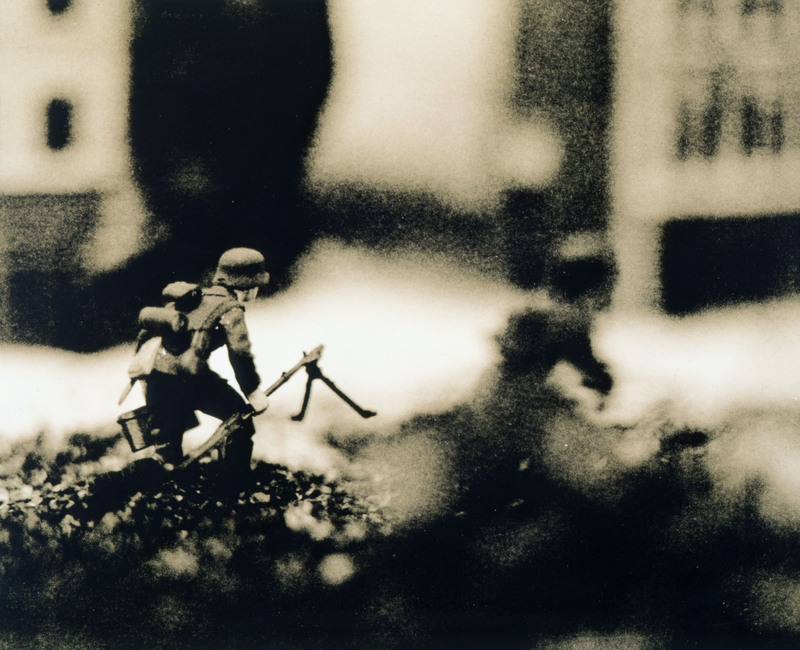 Yet many of his images, most notably those of war, successfully blur the line between plastic toy and real world. Referring to herself as a faux landscape photographer, Lori Nix is known best for her still photos of small scale post apocalyptic worlds. Michael Paul Smith, a diverse model maker, takes his cars outdoors to photograph in the real world with forced perspective. While he’s received online media attention quite recently, he’s been photographing toys for over 25 years. In modern day, there are plenty of us who create images with this goal in mind. But there are a few I’d like to mention who are truly succeeding in making this phenomenal form of art that are not always known in the toy photography community. Matthew Albanese began creating insanely real scale model photography in 2008. In his outdoor landscape photos, every details is scrutinized over before the photo is created. Felix Hernandez Rodriguez, most widely recognized as of late for his work with Audi, has a keen eye for detail, atmosphere and light and uses it to make some very believable shots. And that’s where I’ll leave you today. 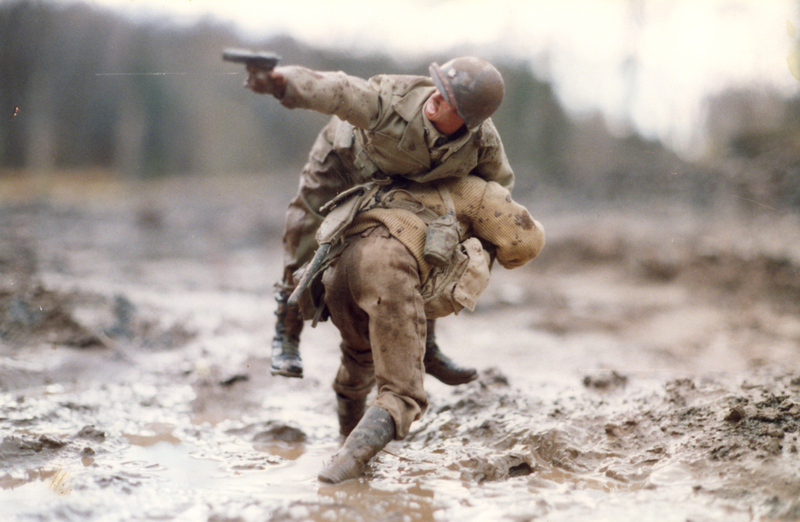 What toy photographers do you think are making the most realistic images? And do you prefer photos that show the lives of toys or photos that try to make toys look real? Vesa left an intriguing comment on my history of post, wondering about toy photogs of history that haven’t received widespread attention – those that have been dabbling in the hobby that we just don’t know about. In response I made an Ask Panda over on Bored Panda, and hopefully, in time we will have some contribution. Go ahead and add your toy photo to the mix if you’re so inclined and share it about – http://www.boredpanda.com/have-you-ever-made-a-toy-photo/. I like both kinds of photography, but the ones that use toys in ways that looks like real photos is the stuff that leaves me in awe. It is something I strive to achieve in my own work… someday. Completely agreed. I think both types have their merits and stand out creators, but I too largely strive to make my images appear realistic. This was a very good read, I really like this niche of photography. I haven’t looked into this much, I mean seriously dug in, but I’m still intrigued. Even more than with the earlier post. No problem at all. So glad you enjoyed it. I very much enjoyed the research. Thank you also for introducing me to Wesley David Archer. That Nessie photo’s a fake? NOOOOO! I’m a huge fan of Michael Paul Smith’s work. Forced perspective is such a cool technique when it’s nailed! And there’s this other guy, Avanaut, who does some pretty amazing shots of Star Wars ships in woods and garages. Although, I think some of his shots might actually be real photos, just like the one of Nessie! Sorry to break it to you :/ But I mean it is real! A real photo of a toy that is. And Avanaut is truly awesome, you have a good point there. Awesome post, i’ve learned a lot just reading it! I know some of those artists, but i’m particularly interested in Lori Nix. I didn’t know her work but i’m ready to fill the void! Lori Nix is amazing. Glad you have a new artist to explore and that you enjoyed the post! Excellent post, Jennifer! Thank you for doing the research required to put this together, I’m definitely going to check out all of the links you provided. When I first saw Felix’s work, I thought it was real. His eye for detail is insane. I love all the historic examples too, I studied photo fakery a bit in my history class in college, but that was more in the context of Stalin editing photos to change history; I had never really thought about how artists used toys or miniatures to skew the truth too. And I absolutely love that list of miniature movie sets you provided. I’ve always been fascinated by the filmmaking process, and there’s nothing that says “movie magic” quite like a miniature Hogwarts or tiny cities built to manipulate the audience. So cool! The miniature movie sets are amazing. I truly never thought about how often the huge immersive worlds in movies are really miniature models. And of course most of the examples you find, and most I learned about to are of photos where people are edited in or removed or the context is changed etc, but it’s oh so interesting that people were using toys and models to a similar degree. Great in depth article – and so many side things for me to research now – thank you again! Thanks so much. And you’re probably right. Just lied on his deathbed so his legacy would live on or something. Long live Nessie. Another one of your thought provoking posts: Thank you! I think that toys being photographed as toys in connection with life size objects can make very intriguing – sometimes funny sometimes clever – pictures. Currently, I am more caught up with ‘make believe’ though, with making it all look real. However, I wonder if there is a line I do not want to cross: If the pictures look so real you have to tell people (is so many words) that you really, acutally used toys here and that what they see is not what they think they see, what is the point? It seems to be more of a challenge to make a scene look real yet leave visible hints to the real (small) scale of the objects… Well, that’S what I think now. But I might change my mind in the course of further indulging in toy photography. Thank you. I totally see your point here. And I’m not sure of the answer. With my work I do enjoy having hints at the fact that the world is fake or miniaturized but I’m not sure I truly hold back intentionally. A lucky flaw I suppose for now. Fabulous post Jennifer! I was pretty happy with myself that I knew almost every one of these artists. Of course my favorite is Mark Hogancamp. Everything about his story ‘gets me’ and his images are amazing. Only someone on the internet would mistake his work for ‘reality’. Well, gotta love the internet 😛 and thank you very much.